Tell us if you’ve heard this story before – a promising yet inconsistent player at an interstate club moves north in order to find a more regular gig in a AFL team. Gold Coast have added another older fringe player with a limited track record of at least one pretty good season. For Miles it was his 2016, for George Horlin-Smith it was his 2014 where he was the 13th highest rated player at Geelong. Since 2014, Horlin-Smith has been hit by injuries, and spend most of the rest of the time in the VFL. However, he has starred in the VFL, having been named in the bests in 18 of his last 21 games at that level. The Geelong midfield has long been a formidable unit to crack into, and at Gold Coast he should find an immediate chance to get AFL games (if fit). Notionally, the pick has more value on future projections here. 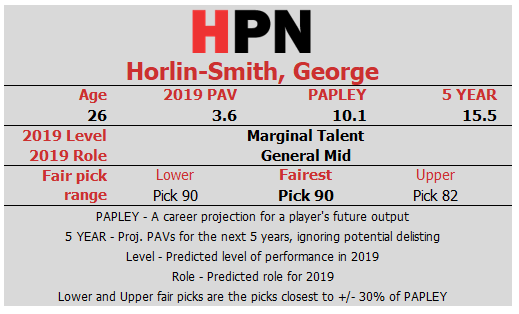 The trade values Smith at something like two decent seasons of output, which is more than he’s being projected for based on his recent time at Geelong. As with several other trades this year (Hall, Miles, McCarthy, Kent) the bet is low risk speculation on both sides. One club gives up a speculative later pick with some prospect of producing value, the other releases a player outside their plans who could either disappear without a trace or find regular senior footy. This is the real guts of trade week. Verdict: Unfair trade. Geelong get more value, but low stakes all round.